As fans prepare for the onslaught of awesomeness that will surely be unleashed in less than two months with Avengers: Age of Ultron, speculation about the direction of Marvel Studio’s Cinematic Universe continues at a steady pace. However, while everyone has been looking forward, it now seems as though a new theory has discovered a critical occurrence in the film that’s widely considered the black sheep of the MCU, Iron Man 2. If it proves true, then the movie may have given us witness to the birth of could become one of the critical weapons in the massive franchise in the near future. As one may recall from the film, Tony finds himself desperately looking for a replacement power source for his Arc reactor since he was being killed by palladium radiation (creating those unsightly veins growing out of his chest). After deciphering the clues left behind from his father, including a film, some conspicuously designed architecture, and journals, Tony creates an unnamed mystery element powerful enough to keep his life-saving device going while also stopping radiation poisoning. While it was an integral moment within the confines of the film, itself, very few of the speculators chalked it up to anything more than character-building with a hint of MacGuyver-esque constructional montages. However, the aforementioned theory posits that the mystery element may have been the continuity’s first touch the larger cosmic world. Now, here’s where things get even more interesting. 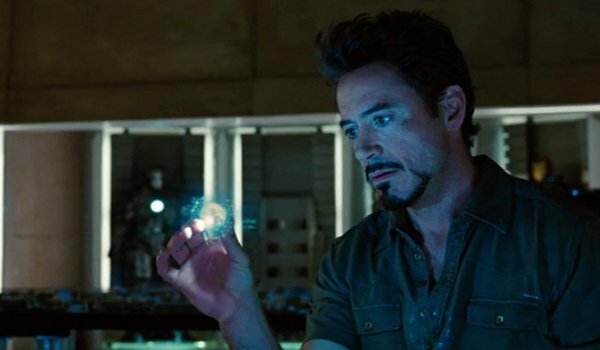 In The Avengers, Loki attempts to use his magic scepter to point at Tony Stark’s heart and whammy him like he does so many other characters in the movie (including Hawkeye and Erik Selvig). However, for some unknown reason, it was unsuccessful. Since it is generally assumed that the gem in Loki’s scepter is either is an Infinity Stone or something related to the Tesseract, it could be the case that the spell failed because the power behind it was matched by what Tony already had in his chest - either cancelling it out or exploiting the interconnected element’s own inability to inflict self-harm. If the theory proves true, then Iron Man 2 may have planted some extremely integral seeds from which a key weapon in the Marvel Cinematic Universe will be used – specifically in the Avengers: Infinity War films. It should, however, be noted that the novelization of the Jon Favreau-directed sequel refers to the mystery element "created" by Tony Stark as Vibranium - the same fictional, lightweight, virtually-indestructible material used to create Captain America’s shield. This does fit rather well, as Howard Stark did have access to the miraculous material in Captain America: The First Avenger, and at the same time is still rather significant, as Vibranium is a material very closely related to the story of Black Panther (who will be getting his own movie in 2017). All of this sounds like an amazing theory that would display an exceptional sense of long-term planning on the part of Marvel Studios for something that could pay off in tremendous fashion. Until anything is confirmed, though, we should probably take it all with a grain of salt.